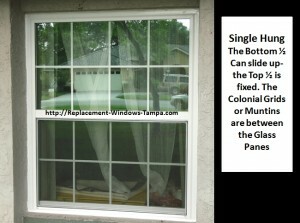 There are really only a few replacement window styles to choose from. Most Vinyl Single Hung windows are manufactured to allow the bottom sash to be raised and then tilted in for cleaning, eliminating the need to remove the screen. Note that the screen on the bottom half darkens and slightly obscures vision. Double hung windows usually can be ordered with either full screens or half screens. If you plan to open both the top and bottom sashes at the same time you will need full screens. This is a replacement window style that most people choose. Note the full screen on this Double Hung. These offer motion of the top and bottom sashes and allow cleaning from inside the home by simply tilting the sashes in. Raise the bottom sash a few inches. Then tilt it in and lean it on something like a chair back. Then lower the top sash a bit and tilt it in, leaning it on the tilted bottom sash. Clean the top and put it back in place. Then clean the bottom. A double hung can be ordered with only a half screen and will look similar to the single hung above. A half screen does not obstruct vision as much and can easily be removed and stored during the months in Florida when you are not planning to open windows. This is a side sliding replacement window. Most 2-lite sliders allow both sides to slide. The ones that both slide offer half or full screen choices. The one pictured here has the screen removed. A window without a screen in place is much more elegant, don’t you think? 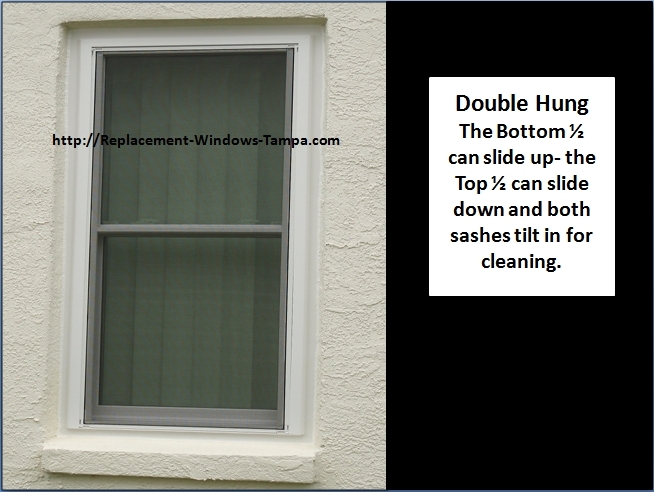 Though 2-lite sliders do not tilt in for cleaning, most allow you to slide each sash sideways just a few inches where you can lift up the sash and then pull the bottom toward you and lift the entire sash out, so you can still have the easy cleaning replacement window style. 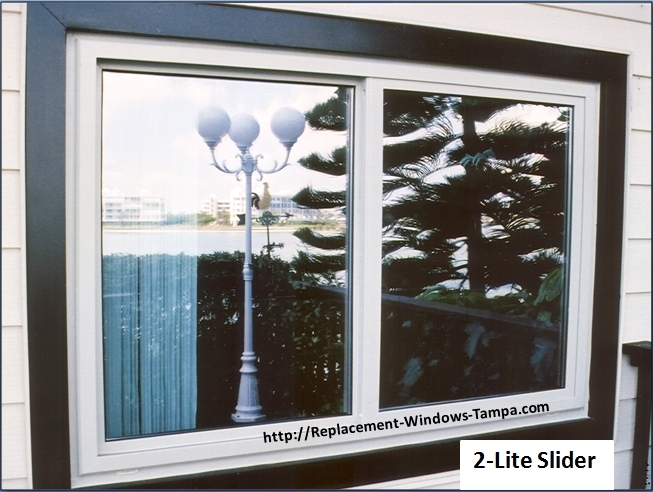 A 3-lite replacement window style is great for a wide opening. They are typically configured with each moveable end accounting for twenty-five percent of the total width. Both ends slide toward the center. 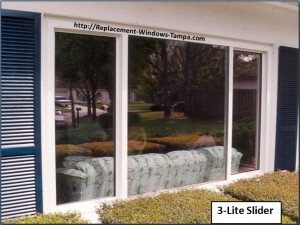 Screens cover each end vent, and most allow easy removal of the moveable sashes just like the 2-lite sliders. Of course you can see that this window is pictured with the screens removed. 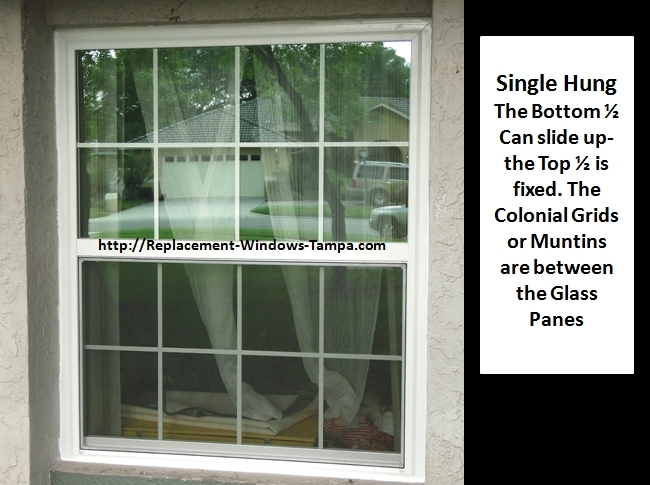 The middle pane is fixed, just like a picture window is only fixed glass with no moveable sashes. These also can be configures as 1/3- 1/3- 1/3 width vents rather than the 1/4- 1/2- 1/4 you see here. Casement is a great replacement window style, but are typically more expensive than other options. The one you see here allows each of the end vents to crank open. The center is fixed just like the 3-lite above. These have internal hinges at the outside edge of the unit and have internal screens. With multiple lock points these seal better than any other replacement window style. Here you see a double casement replacement window style with both vents cranked wide open. No other style can give this kind of ventilation. 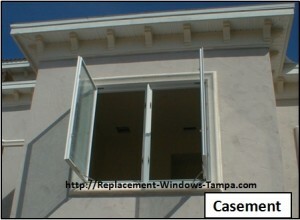 Single casements can also be used when an opening is thin. In Florida there are many bath windows that are only 18 inches wide. Installing a single or double hung will eat up a lot of the opening with their wide vinyl frames. 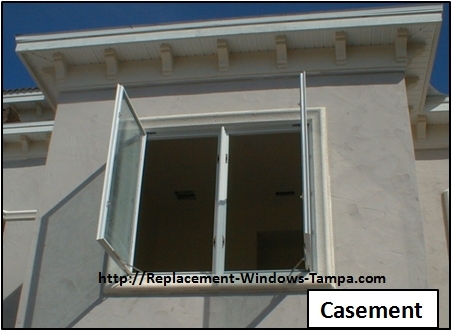 In these situations a single casement is the perfect solution. 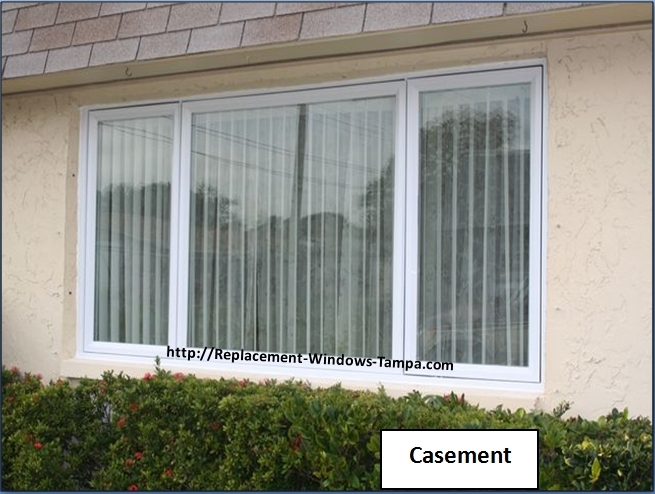 I should also tell you that impact rated replacement window styles are not available with as many choices because of their need to meet impact requirements. If you must install impact rated windows and cannot put an impact rated covering over your non-impact windows, you may not be able to find the style you’d prefer.